SPRING HILL, Tennessee (CNN) -- General Motors idled its Spring Hill, Tennessee, facility as part of its bankruptcy plan Monday, leaving hundreds of employees -- and thousands of residents who rely on the plant's economic thrust -- in limbo. Johnny Miranda is trying to stay positive about the plant where he has worked for 16 years. Spring Hill, about 35 miles south of Nashville, is a town built on the jobs that the plant provides. The town has seen its population jump more than 1,600 percent in the almost 20 years since GM sent the first Saturn down the assembly line in June 1990. 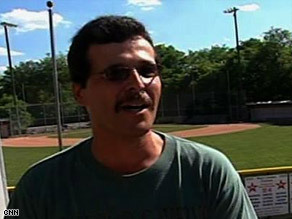 "I want to think positive," said autoworker Johnny Miranda, who left a GM plant in Van Nuys, California, 16 years ago to work in Spring Hill. "It could bring you down. It could really mess you up if you be thinking they're going to close it and you're going to lose your job." The Spring Hill facility ceased building Saturns more than two years ago as sales slumped. After a yearlong retooling, it started pushing out Chevy's crossover sport utility vehicle instead. GM made Saturn a separate division, built an innovative plant, embraced no-haggle buying, opted for plastic over metal for many of the vehicles' parts and brokered an agreement with the United Auto Workers that fostered teamwork between the union and management. For years the company enjoyed a cult-like following. Self-confessed "Saturnistas" attended "homecomings" on the Spring Hill campus. Web sites and fan clubs popped up across the country. One of the sites, saturnfans.com, garnered thousands of signatures on its "Save Saturn" petition in the months leading up to GM's bankruptcy. But Saturn's waning popularity was just one of a litany of problems facing the auto giant, which filed for bankruptcy and announced specifics of its restructuring Monday. In addition to shedding the Saturn brand, GM also plans to end its Pontiac, Saab and Hummer lines, as well. Visit Spring Hill and it's tough to find anyone not affected by the plant's suspension. Every resident appears to know at least one person whose job is on the line. Barnes' father-in-law is anxious, like thousands of GM employees, and has resorted to yardwork to calm his nerves, he said. "He's cut his yard five times this week because this is the level of uncertainty for him, and I hate to see him in that situation," Barnes said. Because of the Spring Hill plant's flexibility following its recent revamp and the competitive local labor agreement, Stansbury said he remains optimistic but uneasy. "The mood of the whole plant is really unsure," he told the newspaper. "We are all tense." iReport.com: What next for GM? When the Spring Hill plant opened in 1990, the town's population was 1,464, according to the Census Bureau. The latest count, from 2007, is closer to 24,000. The Spring Hill plant also gives local governments more than $2 million in lieu of taxes, the newspaper reported. Though the fate of the plant remains contingent on market conditions, few are under the illusion that GM employees and Spring Hill residents will remain unscathed by changes to the city's lifeline. "It's going to hurt," Miranda, the autoworker, said. "No question, it'll hurt." CNN's Jim Kavanagh and Eliott C. McLaughlin contributed to this report.